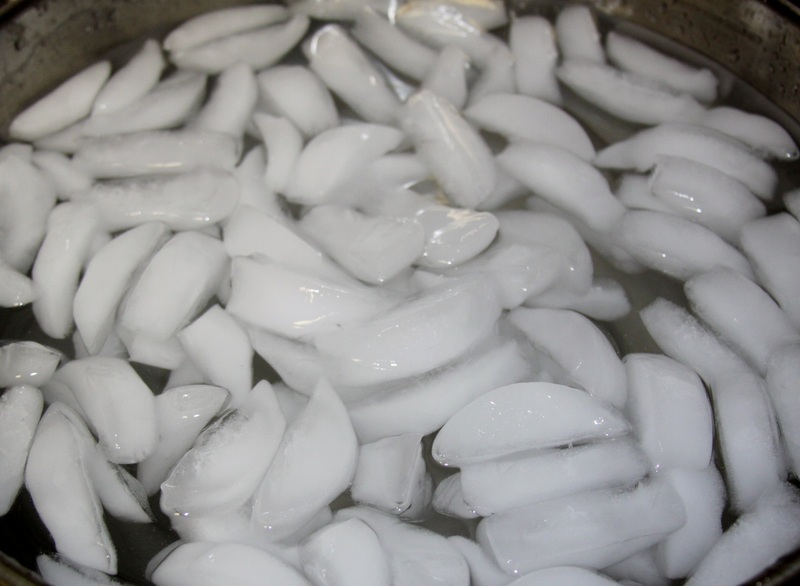 While waiting on your water to come to a boil..go ahead and get your large bowl out and ready with ice and cold water. 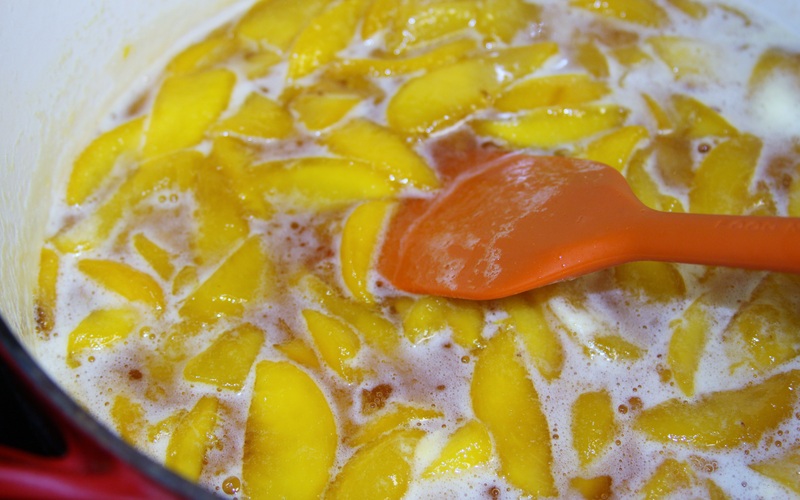 When you start boiling the peaches you’ll see that the skin will start to lose that fuzzy look. 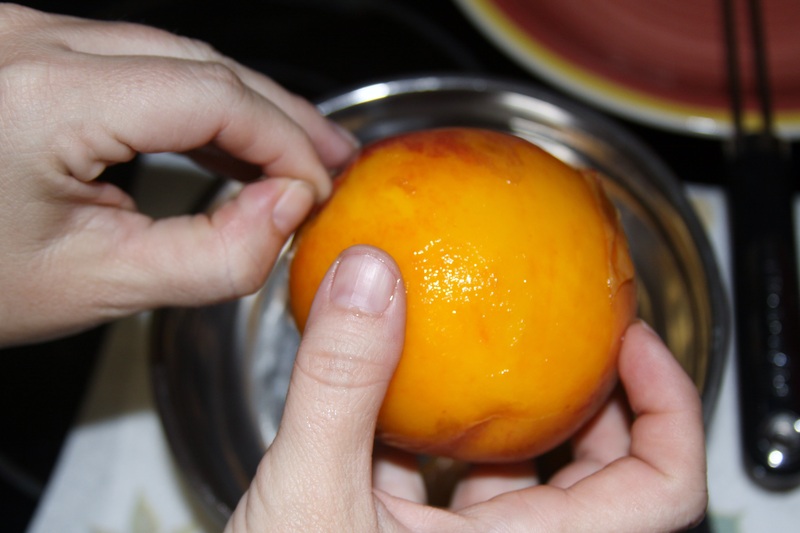 Be sure to use your slotted spoon to spin the peaches around so you can watch for the skin splitting. 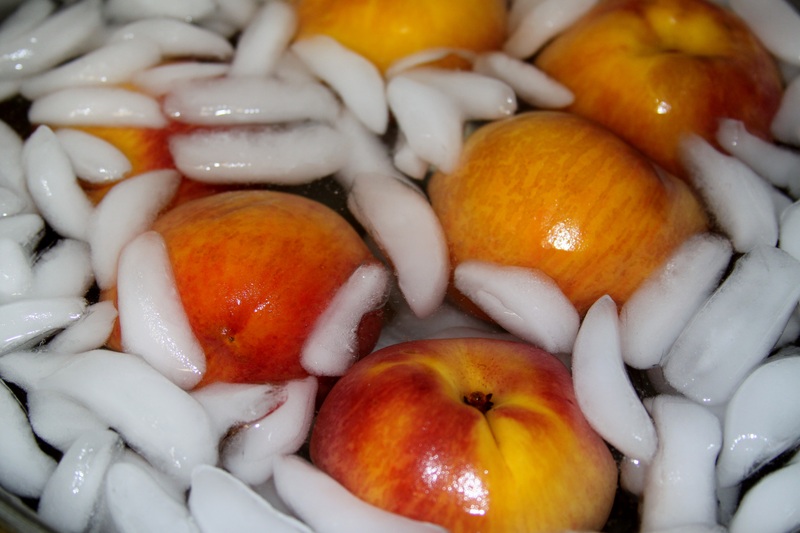 IF the skin starts to split while being boiled, pull that peach out and put it right into the ice bath. 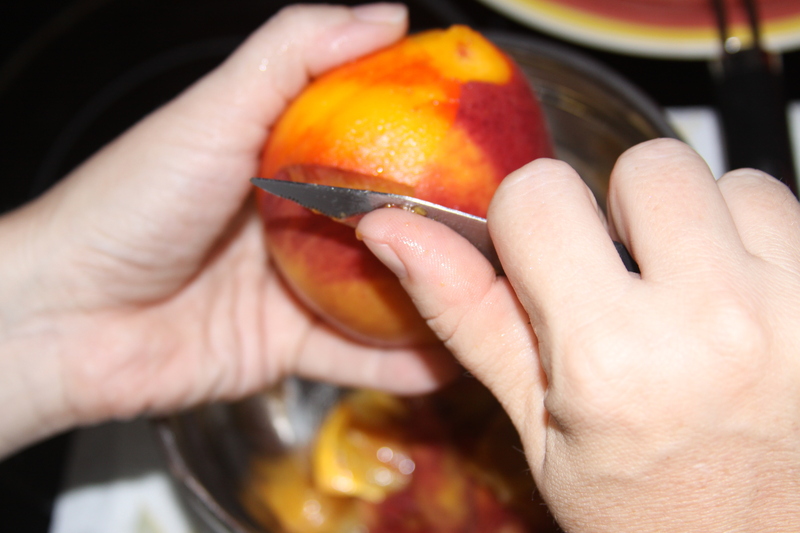 After you are done peeling the peaches, go ahead and cut them up.. 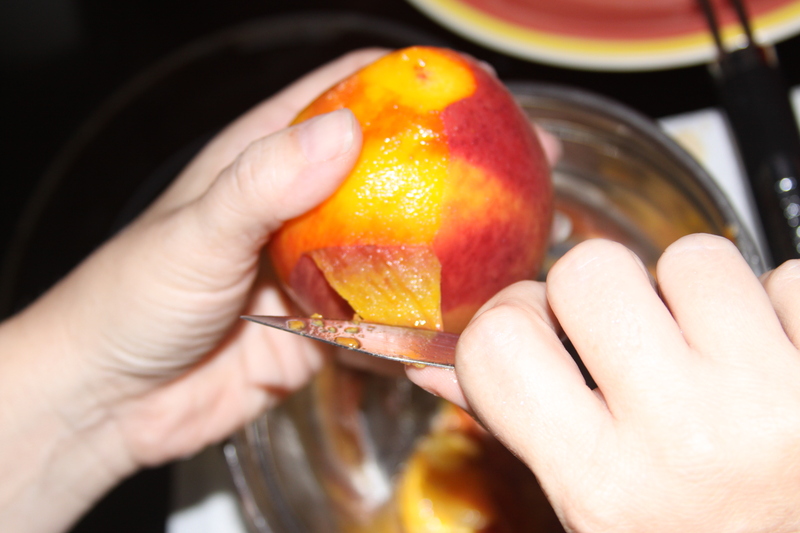 If you aren’t use to cutting them up, a little warning..they do have a center pit, and for whatever reason.. it grosses me out.. No clue why, but it does.. so I’ll cut the peach as close as possible to the pit without actually exposing the pit. Hope that makes sense, maybe not..lol Maybe you won’t suffer from what I have when it comes to this particular task, maybe you’ll be one of the chosen ones that can get through it and never look back.. Maybe I’m rambling a bit here.. 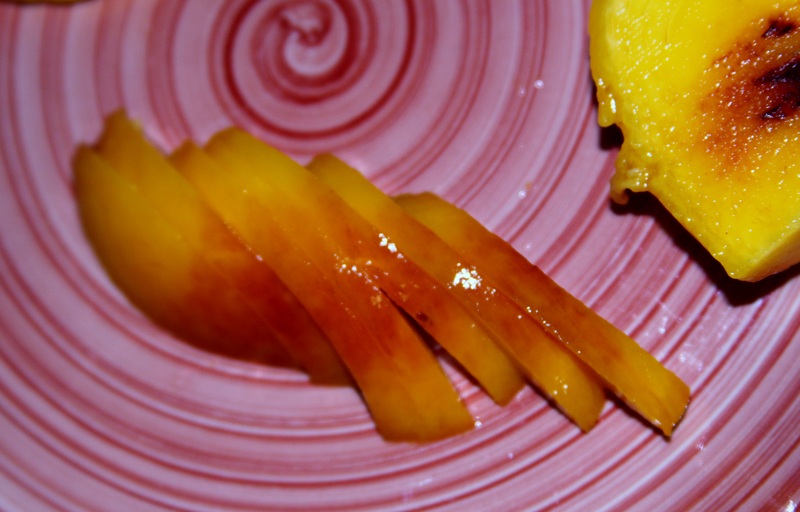 IF you do get some of the pit section on your section that you just cut, just carefully slice it off and move forward.. you’ll know if you did by the rough texture it just left on your beautiful section you cut from the peach..
Once you have your peaches peeled and pits removed, start slicing them up. I try to keep them as even as possible for the next part of the cobbler process, but you do what makes you happy.. My husband bless his heart wanted me to seriously go rogue and dice them!! Really?? 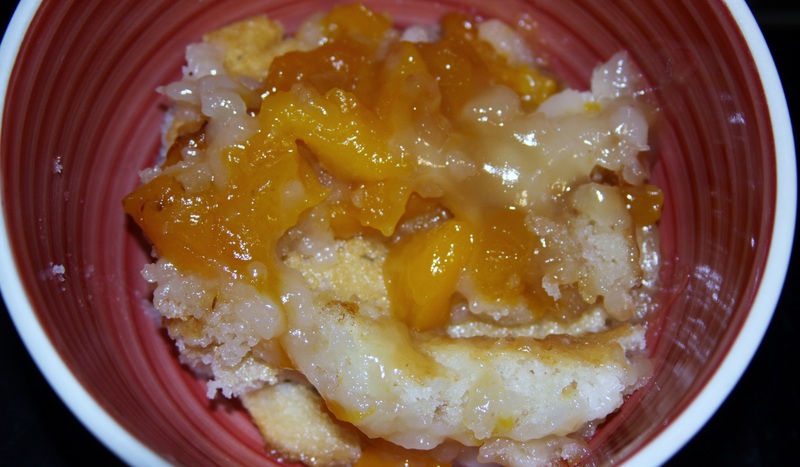 Diced peaches in your cobbler.. 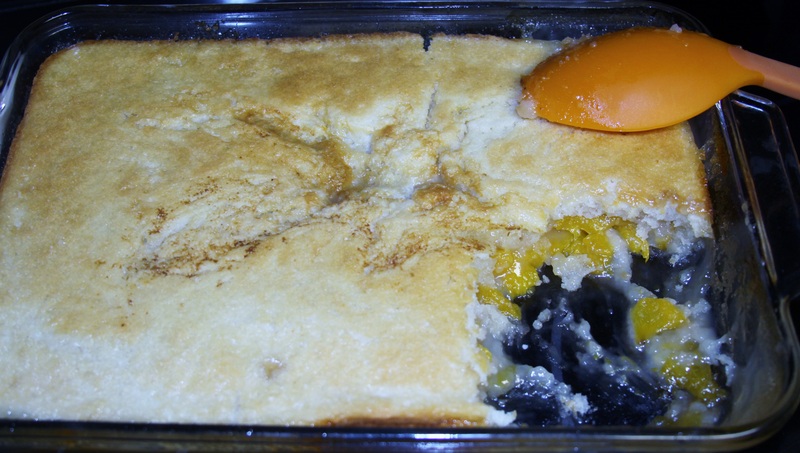 I think that is just wrong and I think it makes your cobbler not look all fancy schmancy like the nice sliced ones do..
Once I have my peaches sliced, not diced (still shaking my head about that).. 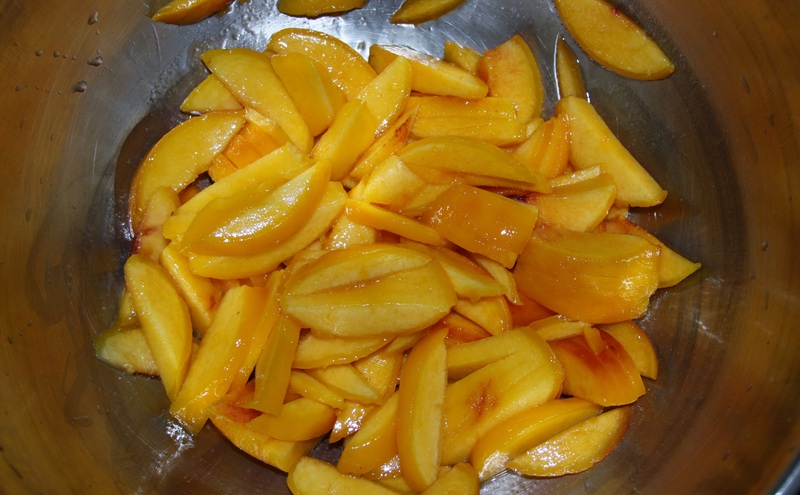 I throw them into my same bowl I used for the ice bath that I cleaned out right between peeling the peaches and slicing them.. Yes I am OCD, and yes I have everything planned out.. 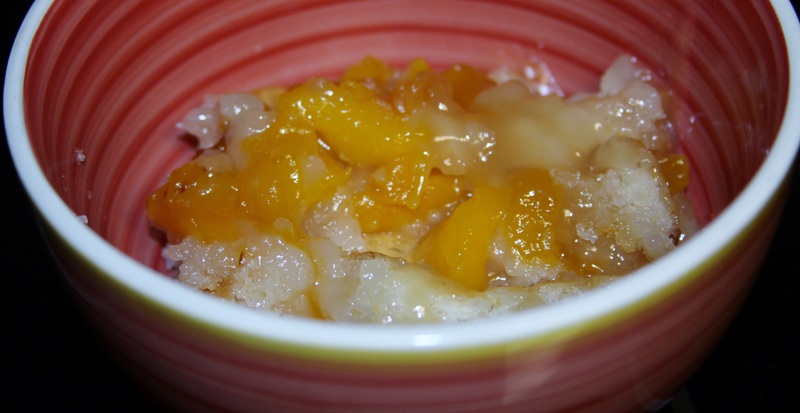 I also don’t like to make as many bowls dirty at one time, so again..less is more..
Now with my clean pot, I add the sliced peaches.. 2 cups of sugar..and 1 cup of water. You are going to mix this up and bring it to a boil..be sure you stir it occasionally. 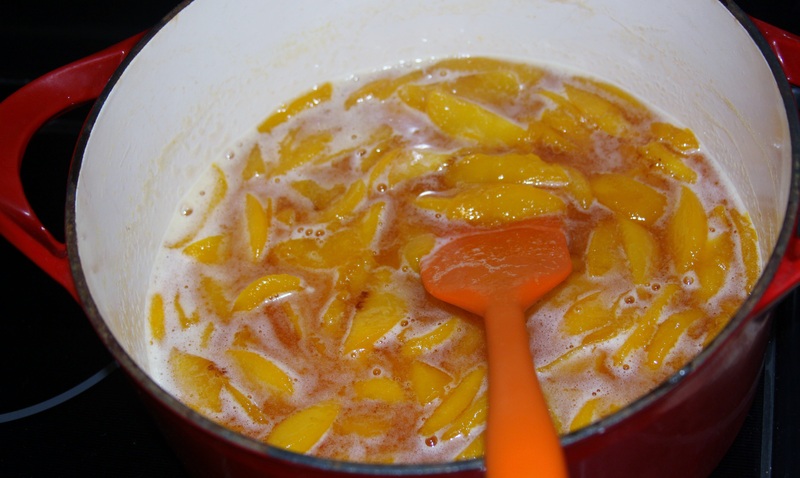 After your peaches have come to a boil and you are pretty certain the sugar is melted.. you can reduce the heat and let the peaches simmer. 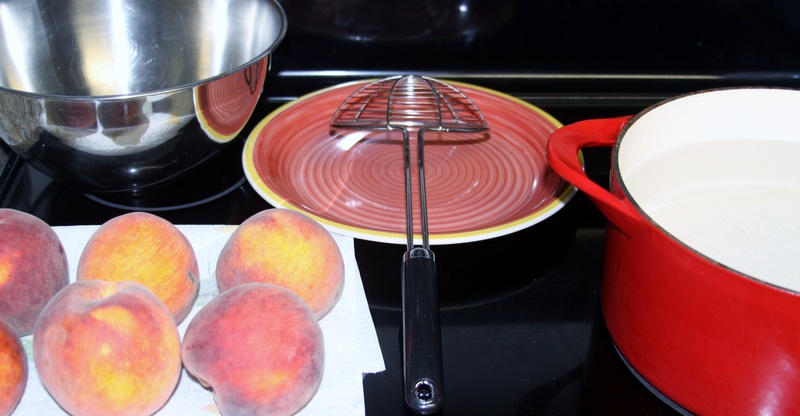 Remember while the peaches are simmering to stir occasionally. 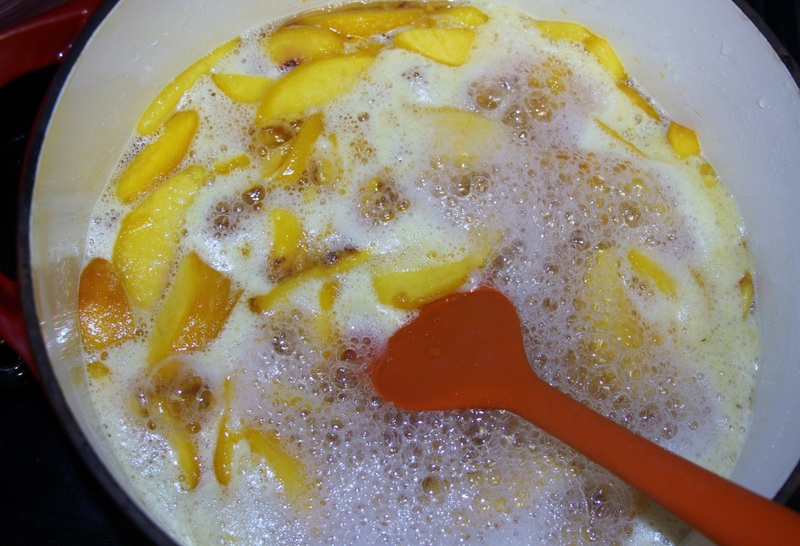 I’ll let them simmer about 15 minutes making sure the liquid really thickens up. 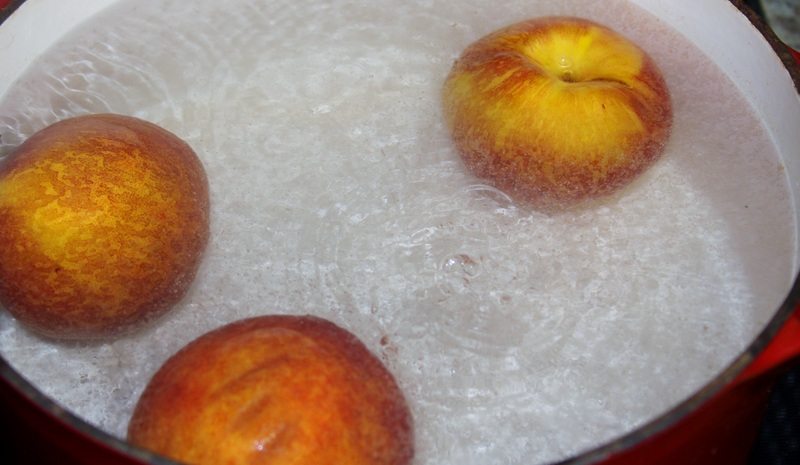 I will then turn the heat off and let it sit for another 10 minutes..allowing the peaches to absorb as much liquid as they possibly can and you’ll see the sauce will really thicken at this point. After the 10 minutes.. 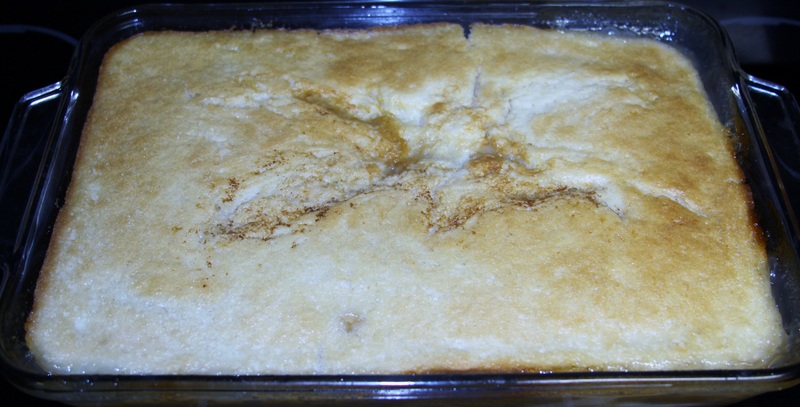 I make my life as easy as possible by putting the baking dish in the cold oven, as well as the stick of butter. 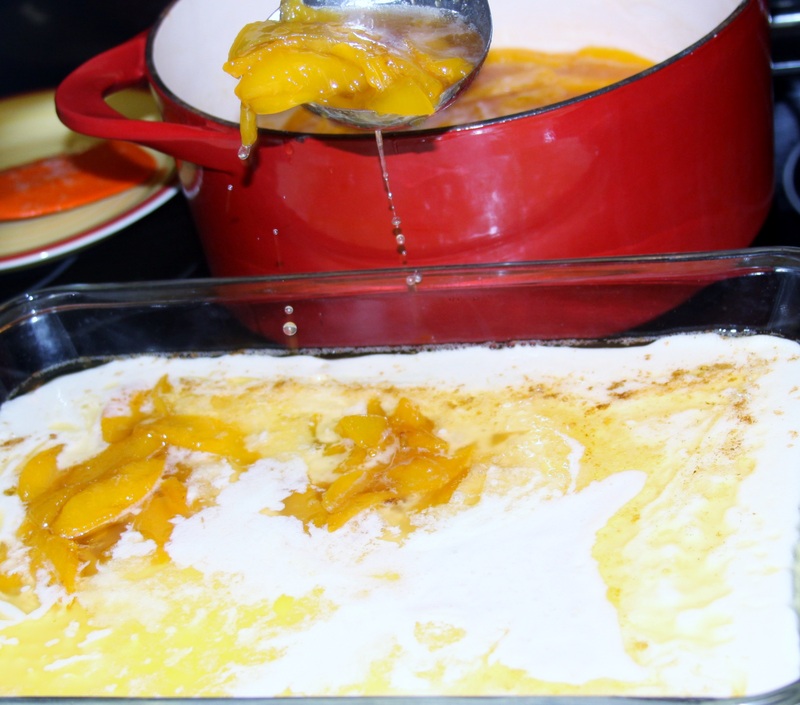 Turn the oven on to 350 and let the butter melt while you put this next part together..
Pour 2 cups of sugar and 2 cups of self-rising flour in your medium-sized bowl. 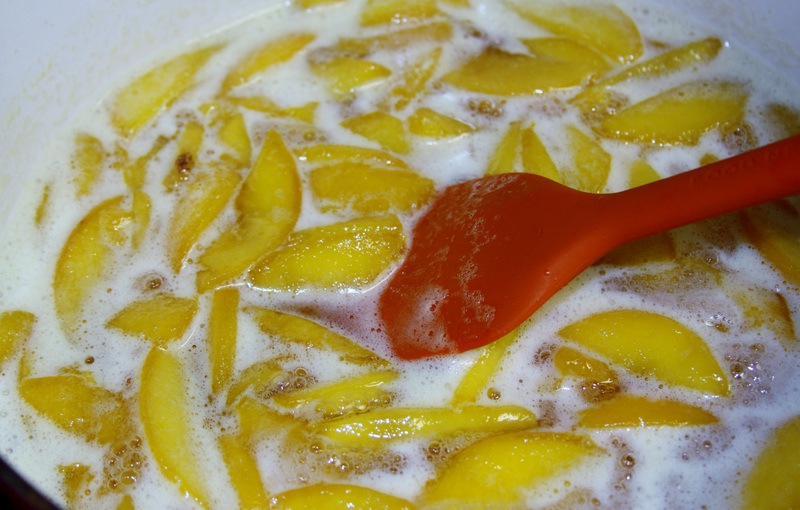 Stir together, just making sure that the two are mixed up. 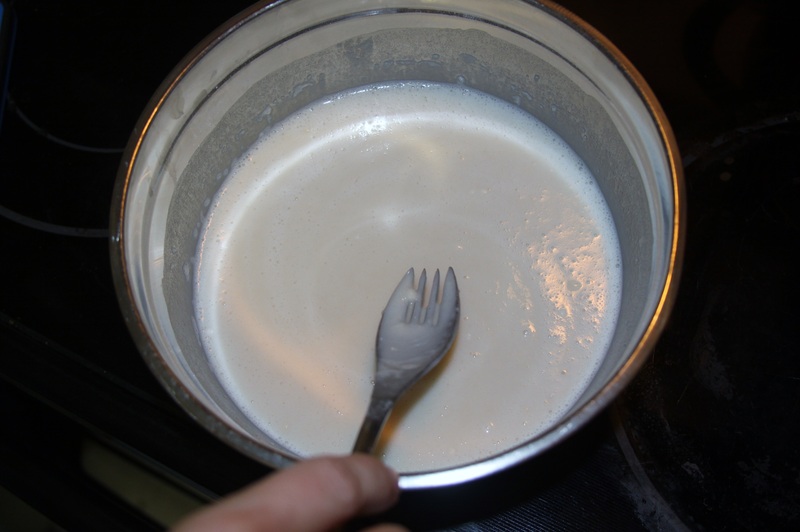 After you have them mixed together, you will want to add the 2 cups of milk. 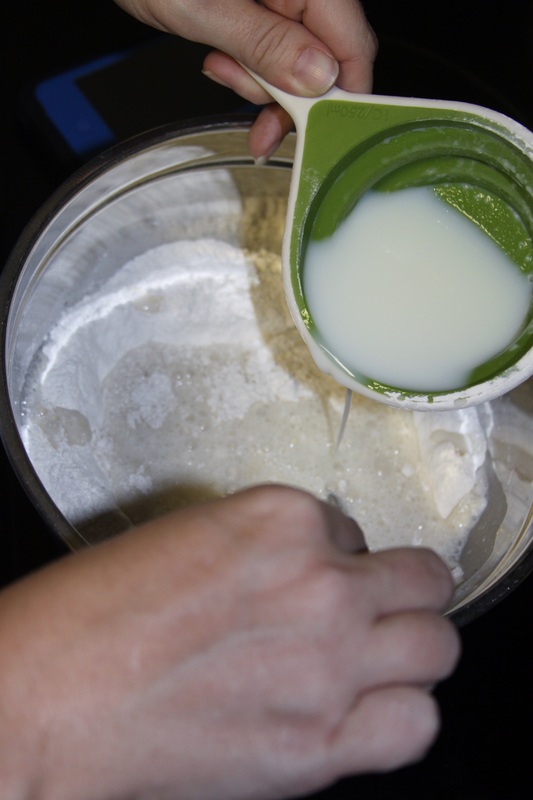 Add the milk at a slow pace and DON’T beat it together with the flour. 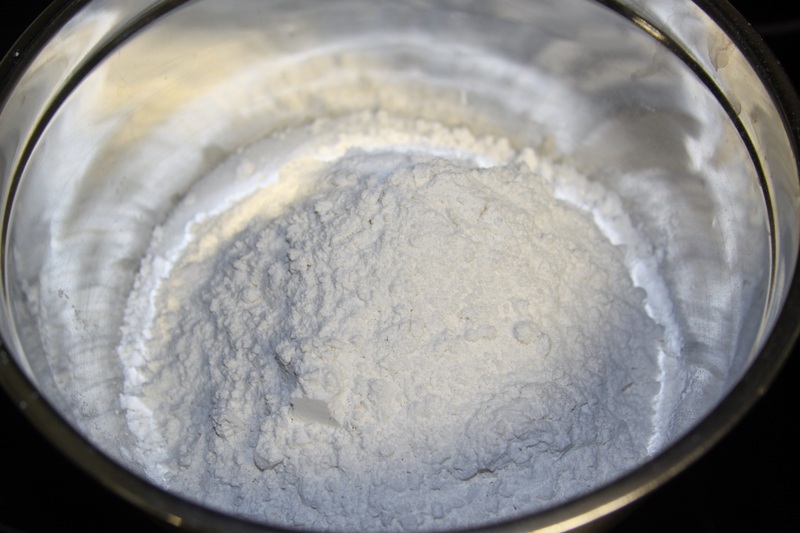 You don’t what your flour to get foamy. 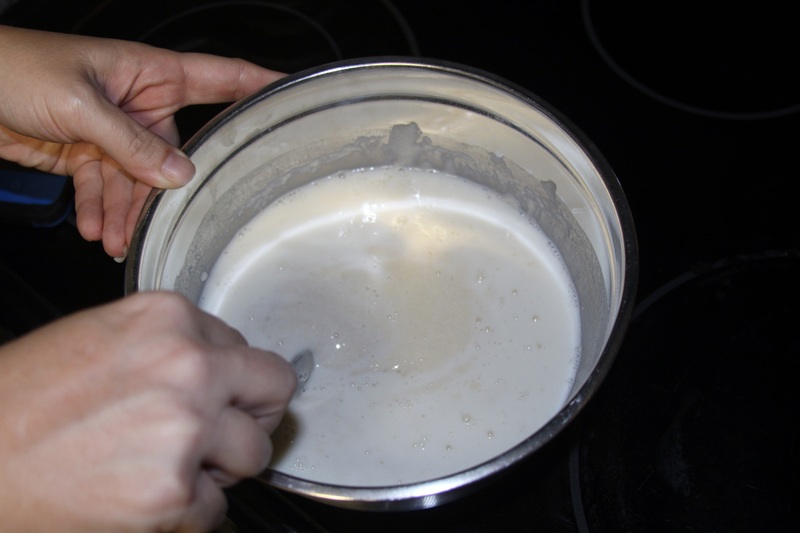 You will want to make sure you don’t have any lumps, you don’t have bubbles (or foam).. A little side note with why you don’t want the mixture to foam..well as soon as the liquid hit the flour and sugar the yeast in the flour became active and it all wants to start to rise right then. 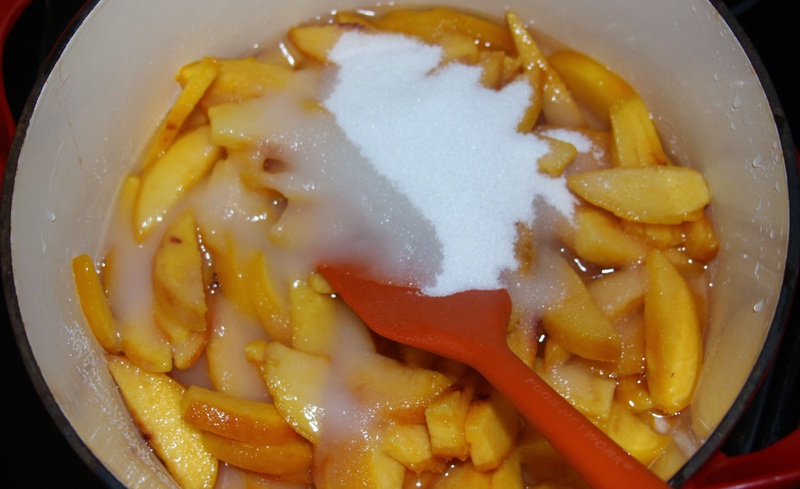 You don’t want to mix this together to early either..if you do it will rise before you are ready to use it and then you just have a hot mess of yuck. 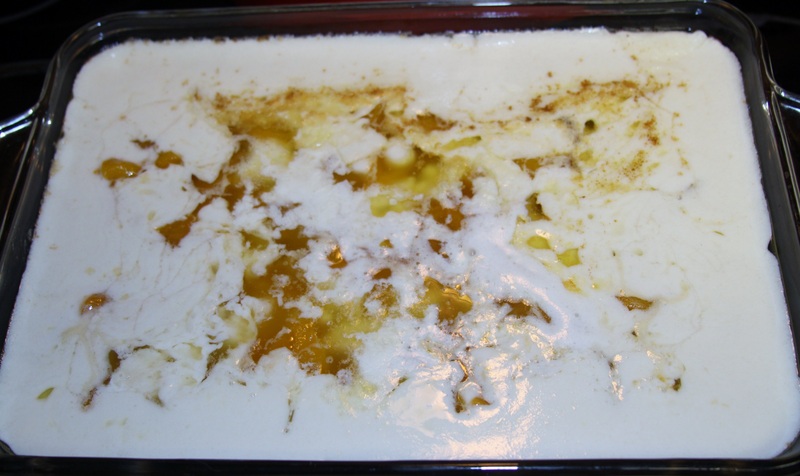 My kids say it has a concrete grey color when it is done..(they are also a bit strange at times and would like random pictures thrown into this recipe, to keep you on your toes..lol) you can be the judge of the color when you have your mixture completed. 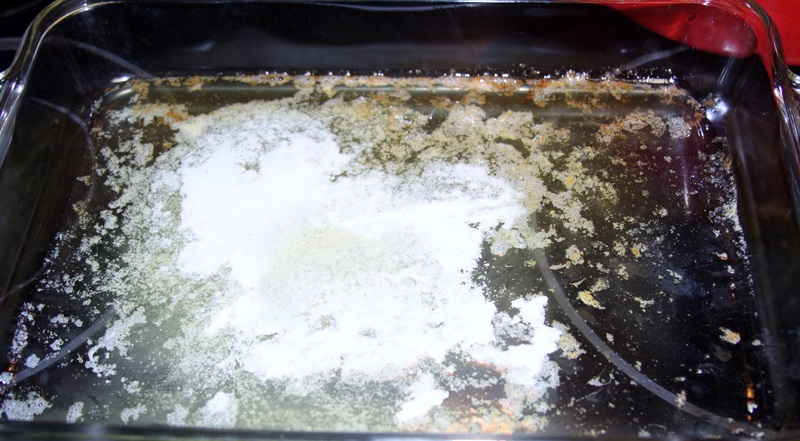 Now that your butter is melted, pull your dish out of the oven.. READ THE NEXT STEPS BEFORE JUST SKIPPING AHEAD.. IT’S A MATTER OF LIFE AND DEATH AT THIS POINT!! 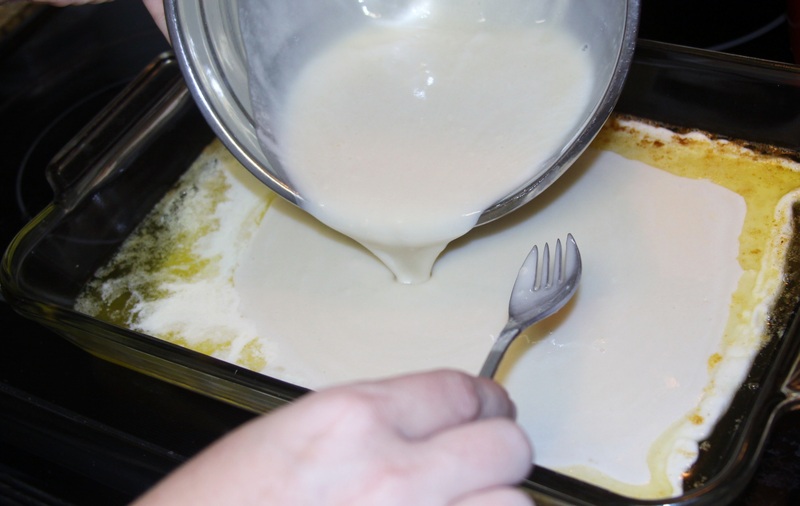 You will want to pour your liquid mixture into the melted butter… DO NOT!!! 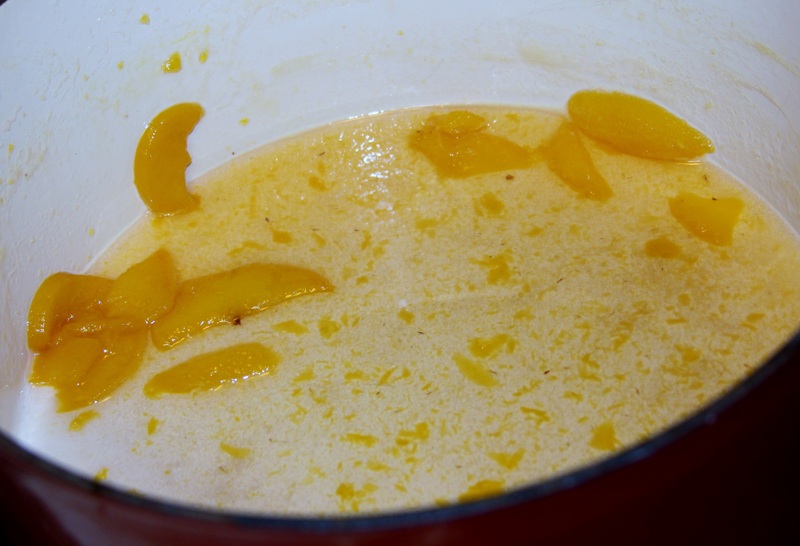 I REPEAT DO NOT STIR THE BUTTER AND BATTER… NOT EVEN IN THE LEAST BIT!!! 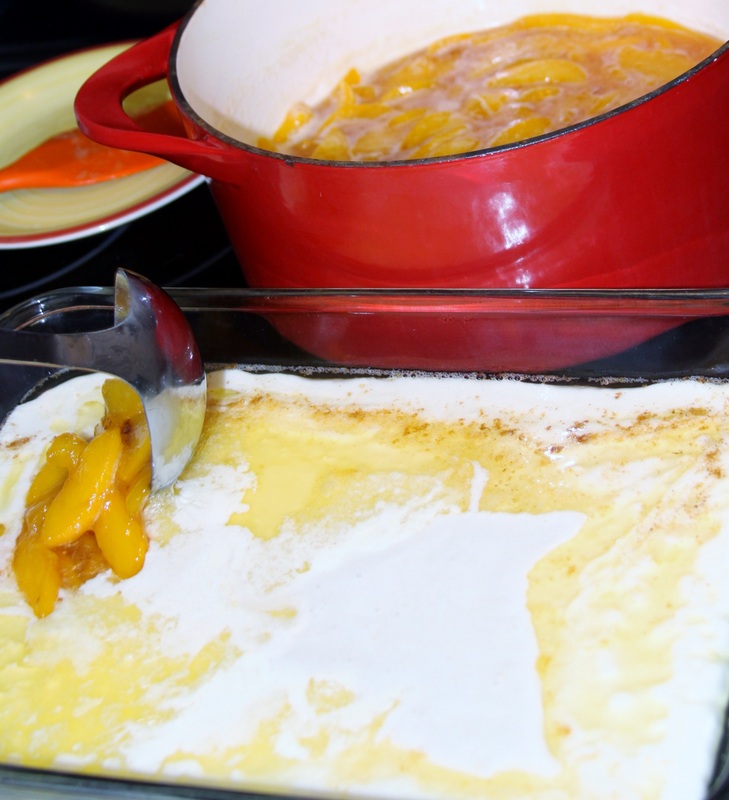 After your batter is in the melted butter.. start adding your peaches and liquid in clumps all around the baking dish.. right on top of the butter/batter combo.. AGAIN DO NOT MIX ANY OF THIS!!! Just lay it on top and all will be fine.. 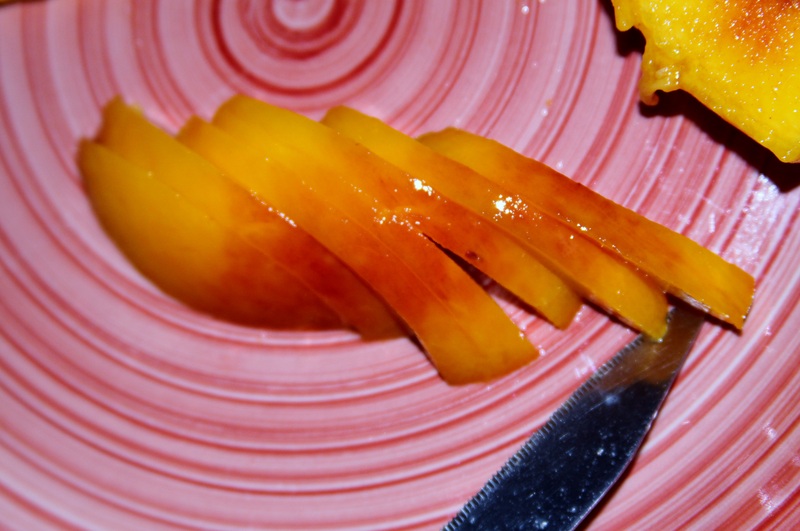 Okay this could be a pretty pointless picture.. but I just really want to show you how some peaches did not make the cut and that it is okay to leave those stragglers behind in a bit of liquid. 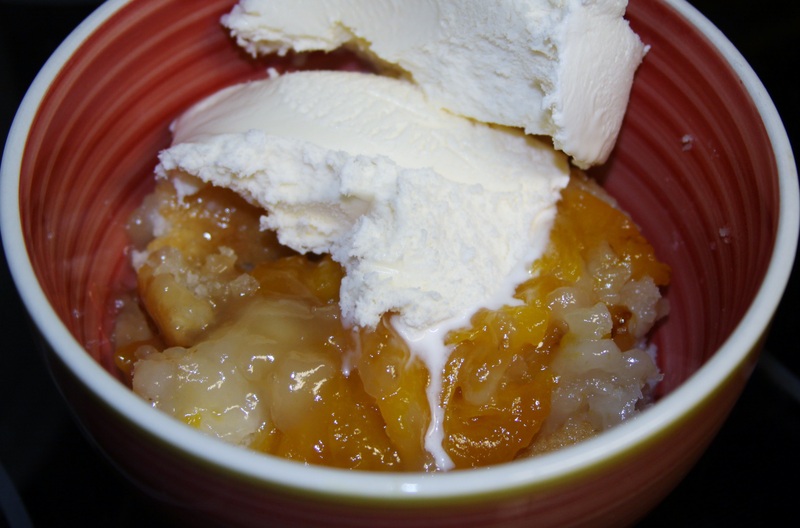 Your cobbler will be done when you have a nice golden brown top..
And DON’T FORGET THE VANILLA ICE CREAM!! !